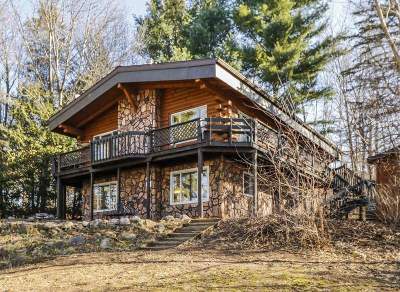 Beautiful rustic home w/ lake access & views to Wisconsin Lake! This home has many wonderful features including 2 large gas fireplaces, natural stone, exposed beams, small pond & amazing amount of natural light. Open concept living w/ breakfast bar & enjoy the lake views from the wrap around deck or walk out lower level. Updates include new carpet, LVT flooring, new countertops in kitchen & bath. Other features: 2 car garage, adorable storage shed, 2nd kitchen, . Two public lake access points within walking distance and public boat launch just minutes away complete this rustic gem!